Monkey Lights are the best way to stay visible at night, and riding with friends is the best way to ride! We’re excited to have worked with 2001 films and New Media Systems on this video. It features a ride by Boulevard Burger & Brew and a ride by through the Virgina Museum of Fine Arts. The video features extensive use of our M232 bike lights, with one Monkey Light Pro thrown in for good measure. We’re excited to release this promo clip from our new video, shot in Richmond, VA with 2001 Films and New Media Systems. 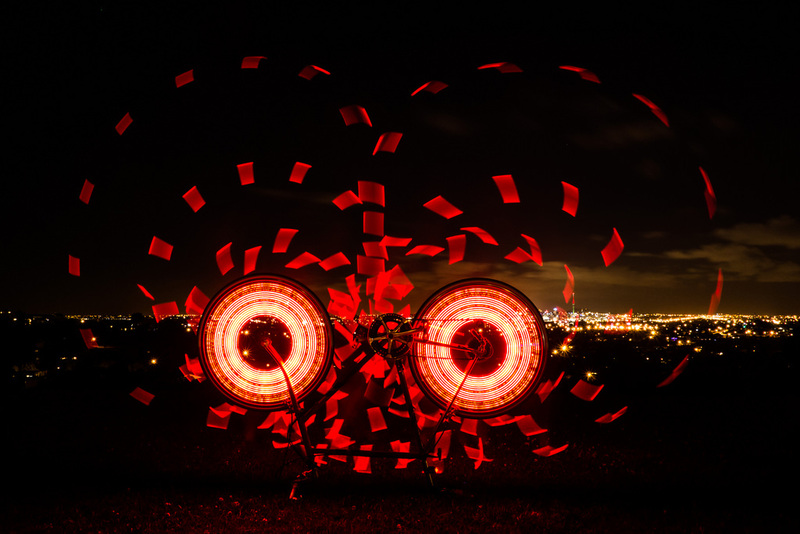 It features many of our M232 bicycle wheel lights and one of our Monkey Light Pros. Check it out, and give it a thumbs up if you like it! It’s been a rainy January here in the Bay Area. John had no problems rolling through some water at Berkeley Aquatic Park with his waterproof M232s. Let’s take a moment to appreciate the M232. 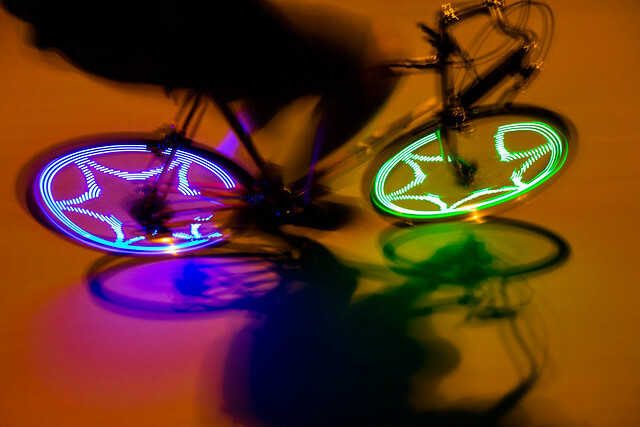 For years we have worked to make the most unique, fun, and durable bicycle wheel lights on the road. Here we explain why in 8 words (that all end in ‘Y’). 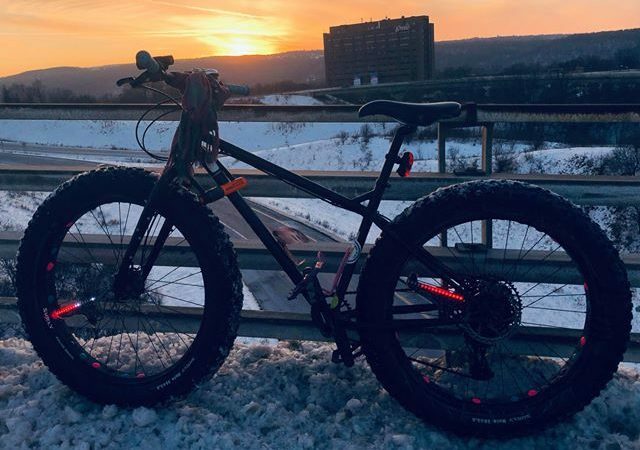 "I have it on a fat bike that has experienced at least a few spills on rocky, wooded mountain bike trails...What impressed me the most about the durability of the lights was it's absolute waterproof abilities. I...submerged the bike up past the pedals. In some areas we had to drag the floating bikes through the water for quite a distance. After the ride... the lights are still working perfectly." "It's lasted thru rain, snow mud, 5 degree to 100 degree weather and the buttons still work fine.Was very doubtful of the quality at first, but it has proven itself many times over." "Secure and durable (dumped hard and its still just fine} Looks amazing, bright, doesn't seems to cause noticeable instability even when I'm going at 35+mph"
"Installation takes a few minutes of zip ties and clippers, and you're done." "These lights are very cool! I bought 2 for my motorized bicycle. They work fantastic on it. They're extremely easy to install and also very simple to use. It took me about 10 minutes to install them on my bicycle. I'd suggest keeping the packaging for them to keep the list of patterns. A really great accessory for bicycles!" "The 232 is vastly improved because it's easy to select one of the 42 themes by only pushing one button repeatedly." 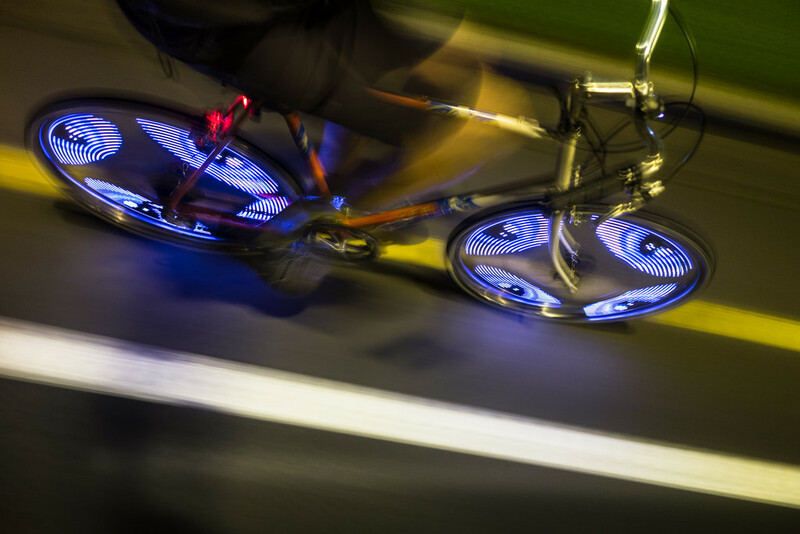 "If you ride your bike at dusk or in the dark, it's important to make sure you can be seen. Here's a product that will help. 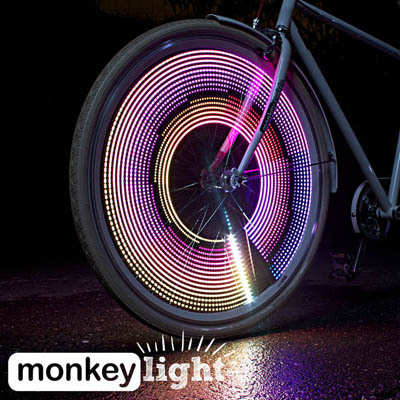 Monkey Lights help you stand out in style by digitally displaying bright, colorful lights and designs with every turn of your wheels." 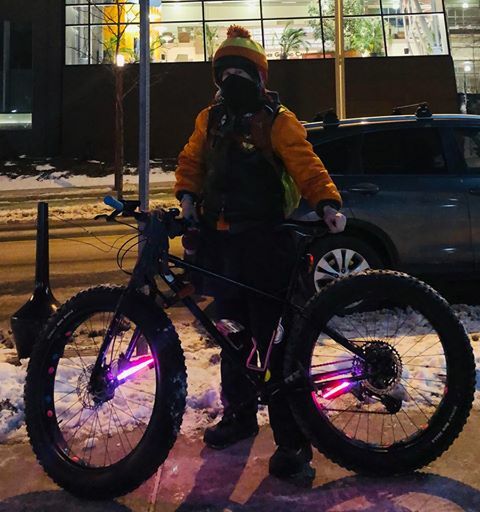 "I was commuting to work several mornings a week before dawn and even with two super bright headlights, flashing taillight and Illuminite reflective clothing I had close calls with drivers when standing at intersections because they just didn't notice me. Monkeylight seemed to make a difference. 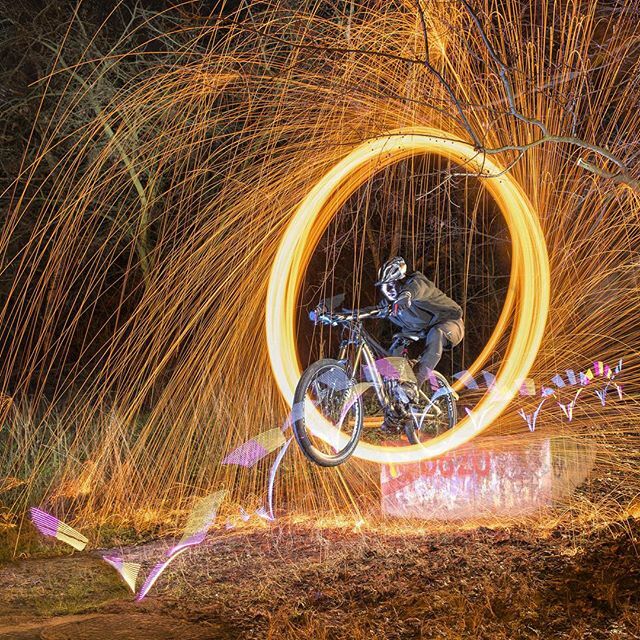 Even stopped it's like having a roman candle in your spokes." 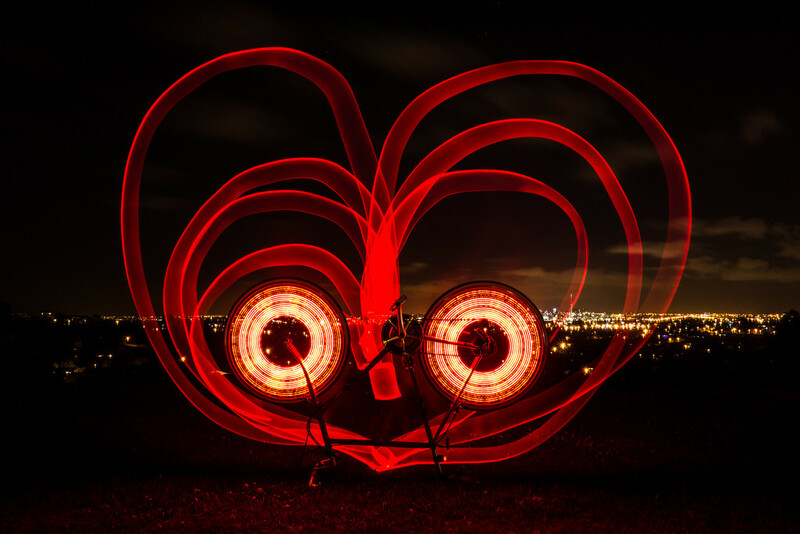 "I purchased another lighting system for my granddaughters bike wheel before getting the Monkey Lights. The other system wasn't bad, but it didn't even come close to the effect you get with the full color and the fact that it show on BOTH sides of the wheel." Each M232 is carefully inspected before and after molding by one of our production techs. "They are so awesome and you get what you paid for, quality. 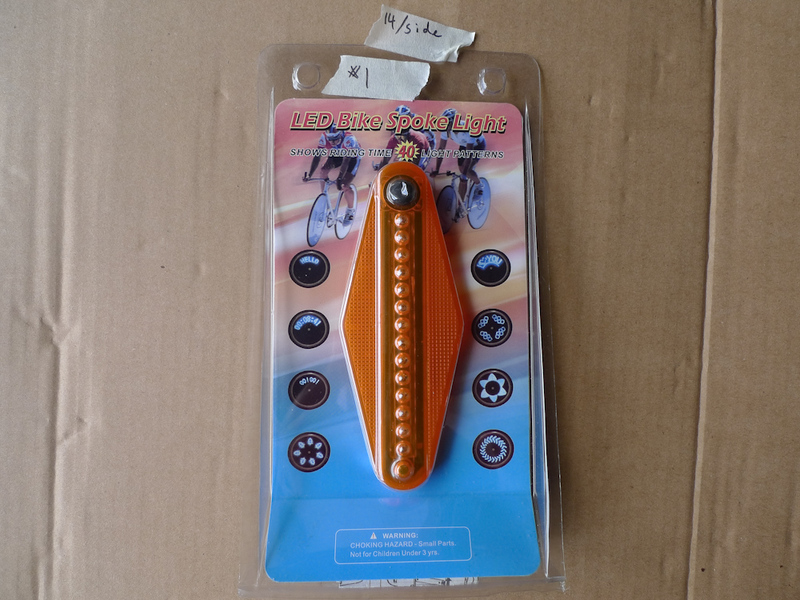 They are definitely the best bike lights for their price and quality." "Quality is better than I expected on the overall body and LED protection. Waterproof and shockproof as well. 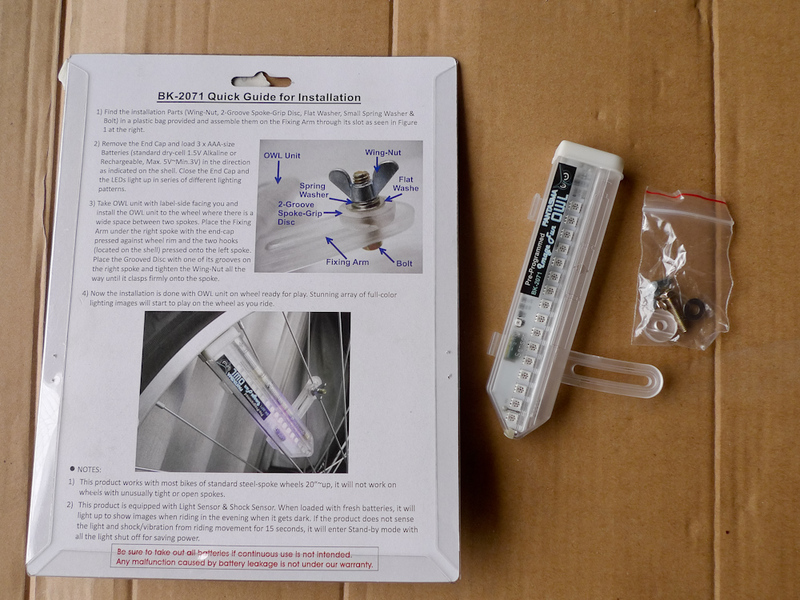 The LEDs are superb and very high quality." "I bike about 60 miles a week, 30 of those using these lights (at night), and I only had to change my batteries once after about 3 months of use." "The battery mounted to the hub is a great idea, since you can easily get rechargeable AA batteries and carry extra with you, no need to spend a fortune on some weird-sized watch battery!" "The new 232's also moved the battery from the board on the spokes to the hub of your wheel. This help reduce weight balance issues and seems to make it easier to change the batteries... One battery pack can run two light units! This cuts down the weight in batteries, it does reduce the run time of course but since the batteries go into a quick load housing you can have the other set from your second light on hand to swap out and it takes just seconds to swap. I bought an extra set of rechargeables so that while I'm riding with one set, I can have another set charging at home!" "Even if you are a total cruiser with one array on one wheel, these M232s are going to light you up and make people notice. With a double array you can go slower and still get full patterns... If you live in a place like Seattle (like I do) where the sun doesn't shine that often, you can probably get use out of them during the day." "These are great. With so many neat designs, I change up the pattern every time I ride." "The pattern selection is bigger than the originals and you can select certain groups (like the classic patterns or groups of new patterns) and you can pick out groups of colors to customize your ride. I like to change the colors to reflect holidays like orange and purple for Halloween or to have different colors for each wheel." "With no argument or fuss they put in a warranty order and it's on its way to me. Fantastic customer service as well. Defective products can and will happen...the difference is in how the company deals with it and Monkeylectric gets an A+++!" "THE BEST CUSTOMER SERVICE EVER... Wow! Talk about a company that stands behind their product and goes the extra mile for their customer... I cannot speak highly enough of this fantastic product and company." "I managed to separate the wiring leading from my front light to the battery mount (some clumsiness when I took the front wheel off to mount the bike on my car). I checked with the company to see if I could send it back to be repaired, and they actually instead are replacing the broken part... I love the fact that not only is the product fun and a great tool for safe riding, but the customer service is also superb. I will certainly buy from MonkeyLectric again!" "The Monkey Lights are such a fun addition to any bike. Watching the video online made the installation very easy. 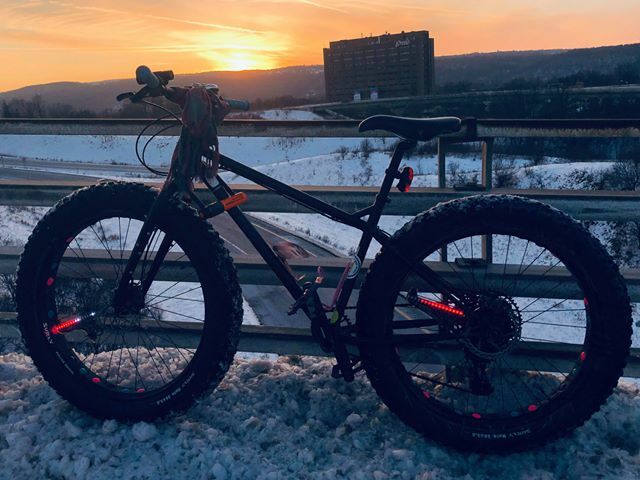 I have had one set one for over a year and just ordered a 2nd set.My first set is still on the bike just as securely as the day I installed it." "Not to worry about [them getting] stolen: once they're on, they're ON. They're also pretty discreet when they're turned off." "The metal security ties that were included actually appear stronger than I originally expected." We did some processing in Adobe Lightroom to correct exposure, since there was a lot of variation in the amount of light that each wheel light produced. We applied identical processing to each image, and then we turned those photos into an animated GIF. You can see a little bit of the tire in each image, in the upper right hand corner, and depending on the amount of light produced, you can see more of our test setup, and the wall behind it. We used 2 different spinning wheel displays, so if you pay close attention, you can see slight differences. Overall, we were really surprised at how much brighter our M232 is. We see a ton of them every day, so maybe we have just gotten used to it. Our M232 is fully waterproof, emits 200 lumens of light. The M232 has 42 unique themes, 5 shuffle settings, hundreds of color combinations, and will run up to 20 hours on a single charge. 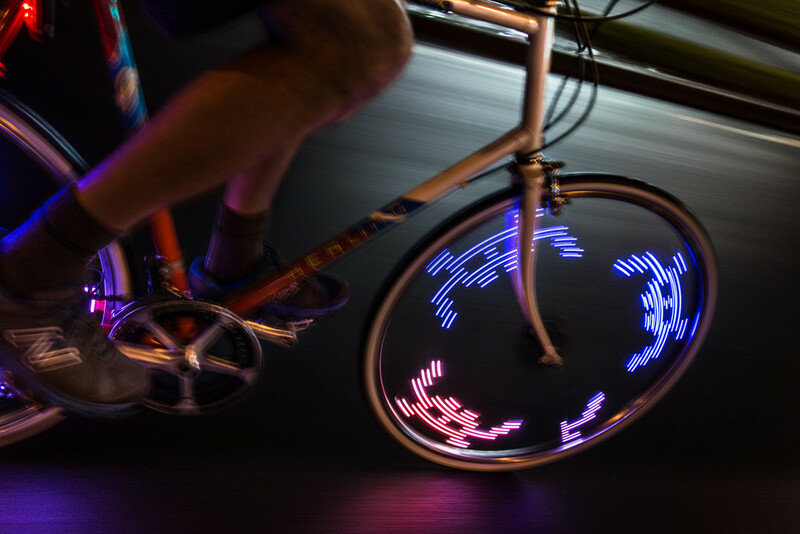 With 32 full-color LEDs, it provides 360-degree visibility for your bike. 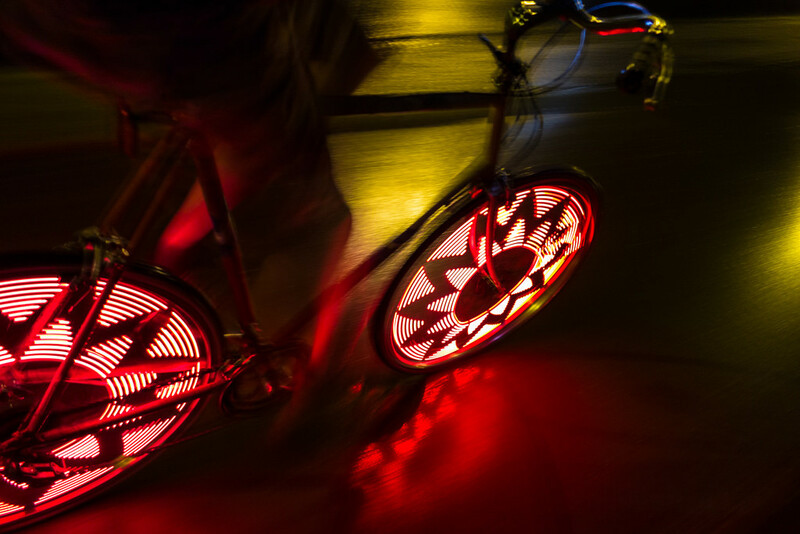 Hokey Spokes are unique bicycle safety lights that allow riders to display computer-generated images and text inside the spoke cages while riding at night. Not only are Hokey Spokes fun and interesting, but they also provide important side visibility, which is mostly unavailable in today's standard bicycle lights. Mounting the Hokey Spokes was frustrating to me. I had to use a Philips head on a loose bolt/retainer nut while mounted on a wheel and I had to hold the light in place at the same time. There are 16 LEDs total, but they are mounted to shine on both sides. Each LED is a single color, so while there are green, red, yellow and blue LEDs, there is no color mixing. This really limited the types of patterns that the light could generate. Also, The text was hard to read. You can program your own text, but you have to do this letter by letter, using one button to scroll through your choices. Letters are represented by a 5 LED code. You are also limited to 16 characters, including letters and spaces. You need to do the programming while looking back and forth between bright LEDs and the code key on the box. This would be best programmed in daylight because trying to read the instructions in the dark after you just looked directly at a bright LED is problematic. One side of the light clips on to the spokes, while the other has a grooved plastic washer that slides along a track so that you can adjust it to your spokes. The grooves on the washer are meant to grip the spoke, but they also happen to fit perfectly onto the ridges surrounding the adjustment track. This was initially confusing because the ridges on the track seem to serve no purpose other than to hold the washer in place, but that puts the ridges on the washer perpendicular to the spoke. I feel like more than one person worked on this design and they weren't talking to each other. In any case, the Fantasma OWL Image Fun BK-2071 ended up being one of the easier lights to mount compared to some of the other non-Monkey Lights. There is no way to change the patterns. The light just randomly moves through a pre-programmed playlist. I felt like each pattern should have been given more more play time because I could hardly tell what one was before the other started. It's full color but lacks vibrancy. This light mounts with two short metal bands that are held with two screws each. The battery compartment is sealed with 6 Phillips head screws. The plastic seems brittle, and I think the screws will strip out the holes in time. The patterns were okay, but the light is single color and only one sided. If you mount the spoke light on the left side the lettering will be backwards. You can fix this by holding the power button. This will change the orientation. The light comes with a magnet that mounts to your fork or seatstay or chainstay. There is no way to orient the letters or patterns based on magnet location, so the words might be upside down depending on your magnet location. 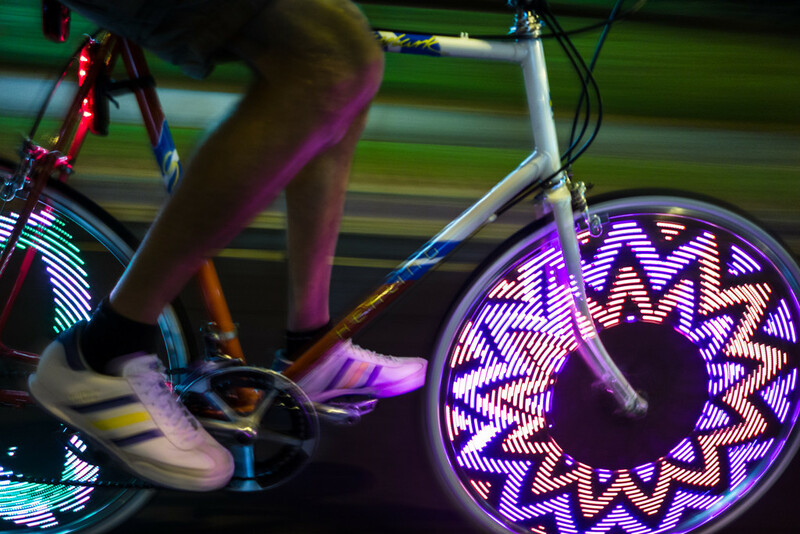 Pictures Magically appear in your bike wheel as you pedal. 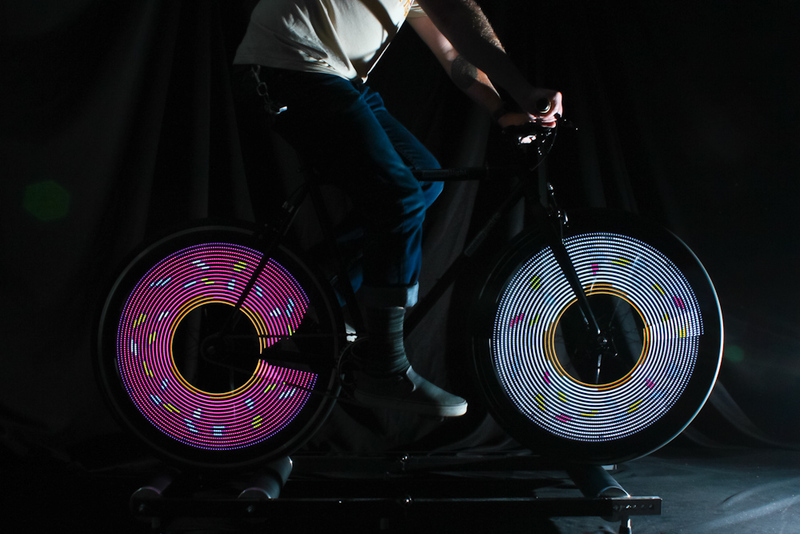 Mount the Wheel Writer directly to the spokes of almost any bike wheel (20" and up) and as the wheel spins, the super-bright computer-controlled LEDs flash on and off to create a dozen different images and patterns - including a real working speedometer. Pinstripe your bike or scooter with cool futuristic light. Includes 8 feet of bright blue electroluminescent wire allowing you to make radiant one-of-a-kind designs that stand out from the crowd. The Light Striper mounts to your handlebars or under your seat and include 10 clips and 20 elastic bands for easy installation. Can be used solo or combined, as solid light or in several blinking patterns. 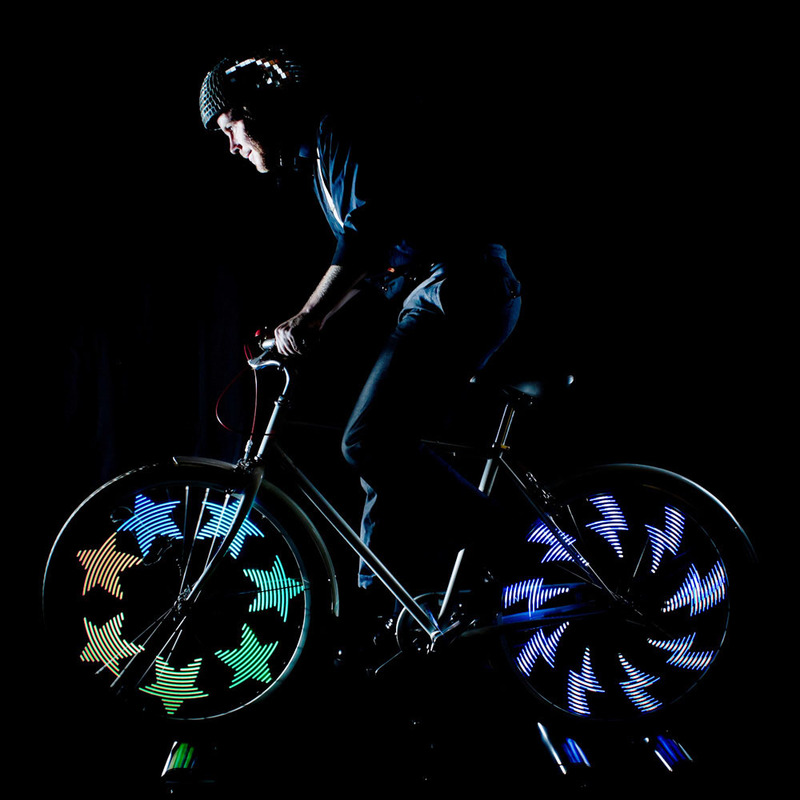 Vibant, multi-color rings of light appear on any standard bike wheel (18" and up). 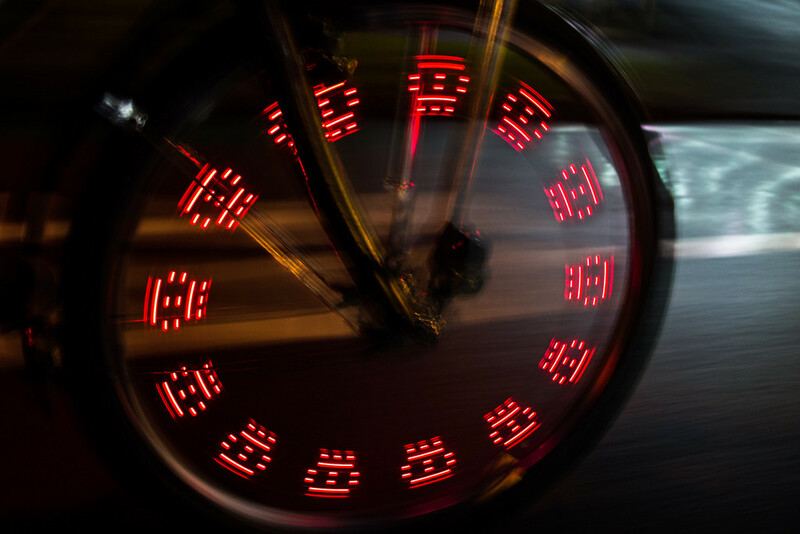 The Gyro Flasher mounts directly to a wheel spoke and two ultra-bright LEDs make unique patterns of spiraling light as you ride. 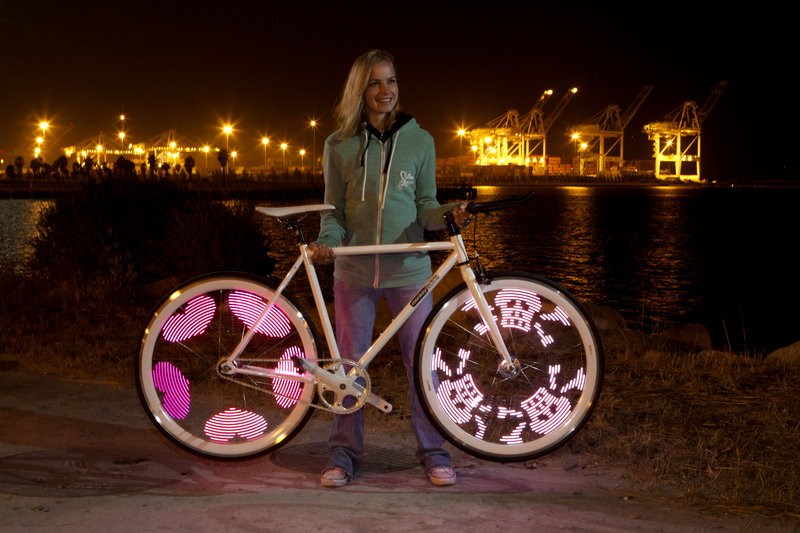 They are the cool and colorful way to trick out any bike. 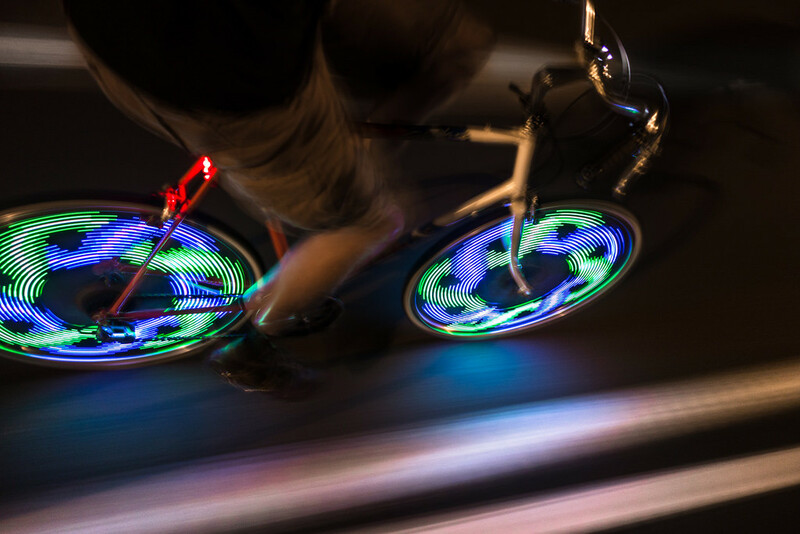 This product, the Meon Light-Up Bike FX, comes with two single sided wheel lights, and a light up electroluminescent wire. One light just creates random, abstract multi-colored patterns with 2 LEDs. The other creates specific images in red and can also function as a speedometer. The wheel lights come in three pieces. You screw the 2nd piece in while the light is in the wheel and then the third while holding the rest of the light in place. The light that creates specific patterns can be set to scroll through the patterns or you can choose your favorite. There is a way to set the orientation so that the images are right side up, but the light single sided, so if you mount on the wrong side, the letters and numbers will be backwards. The Gyro-Flasher light only has 2 LEDs, so it's basically a bulkier, dimmer M204 made from hard brittle plastic. And you can't select the patterns. 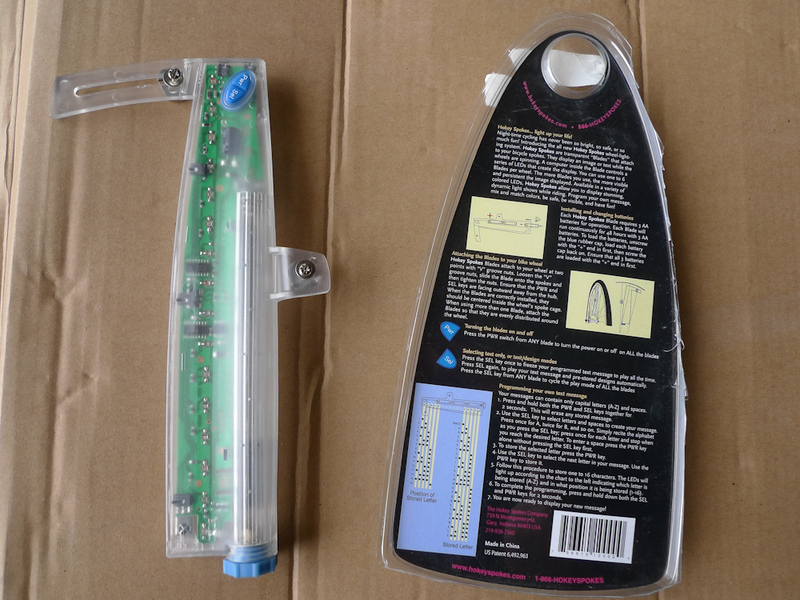 The battery compartments on both require a Phillips head to open. This isn't designed to be a wheel light, so I didn't mount it for this test. Thanks for taking a look at our comparison! We hope that this has been helpful and informative for you. Featuring Johanne Berthou, Leo Nobile, and Jeremy Brosset riding their bikes through dark city streets with our M232 bicycle wheel lights. There are some nice BMX tricks in the full video. We love how the M232’s LEDs illuminate the walkway and side of the building. How Do You Use Your Monkeylight? What are people doing with their Monkeylights? We were curious to find out so we asked some customers who have done creative things with their Monkeylights to share with us. We have been fans of New Zealand's Antoine Pethers since we first saw his collection of bicycle photography. We asked him questions to learn a little more about him and for tips on how he takes such great photos and he was gracious enough to be our guinea pig in the first edition of our Monkeylectric customer profiles. Please tell us a little about yourself, where do you live and what do you do? My name is Antoine Pethers. I live in Auckland, New Zealand, and work in commercial printing. What is your bicycling and artistic background? I loved riding bikes as a child and back then it was a perfectly normal thing to do, we even rode to school. That's rare now as parents perceive cycling on the road as a dangerous activity. In my mid 20s I worked in a design studio and we had this one young guy that was so obsessed with cycling it kind of rubbed-off on the entire staff. Before long I was totally hooked and purchased a mountain bike to race with my work colleagues. As well as commuting by bike we'd meet-up on Sundays to train on empty country roads, usually with the boss and a client in-tow. Ten years ago I dusted-off my mountain bike and began riding to work again. I loved it so much I couldn't stop, and I wondered why more people didn't use bikes to get around, it was so much fun. What is my artistic background? Well I've been interested in art, design and photography from an early age and have worked in those areas most of my career. What is it like riding a bike where you live? Auckland is in the midst of a bike-culture boom at the moment. After decades of neglect a lot of money is being spent on bicycle-infrastructure in the city and it's slowly filtering out to the suburbs. 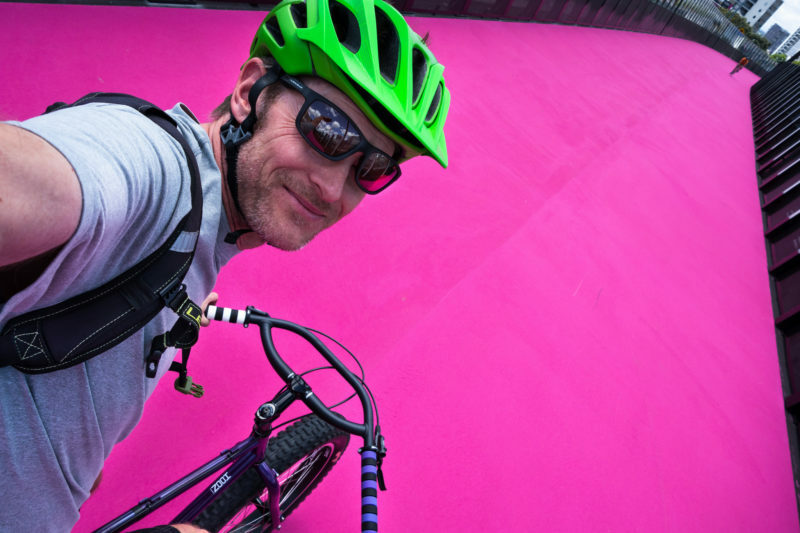 We have some world-class facilities now like the impossibly pink Lightpath, and everyones' fingers are crossed a cycle-path called Skypath will be slung underneath the Auckland Harbour Bridge so those living in the north of the city (like me) can actually ride into downtown. At the moment you have to catch the ferry or ride 50km around the top of the harbour! In my part of town cars still rule and it's pretty gladiatorial, but attitudes are slowly improving. How did you get the idea to photograph your Monkeylights? I'm totally fixated with taking pictures of bikes and once I had that first Monkeylight installed, the patterns were so captivating I simply HAD to get pictures of them. I work shiftwork so most weeks I'm riding in the dark, be it very early in the morning or late at night. I pull to the side of the bike lane, manually set the focus and exposure controls on my compact camera, and ride along holding it out at arms-length. I use a wrist strap for security and hold the camera upside down so I can press the shutter and my arm isn't in the frame. People assume I use some kind of selfie-stick, but at 6' 5" I just have really long arms! Do you have any tips for someone else who may want to photograph Monkeylights in motion? Find a nice wide empty street or you'll ride into something and hurt yourself. Pedal at a steady pace and experiment with slower and slower shutter-speeds until you get the best results. It needs to be long enough that the Monkeylight does a whole 360º rotation and doesn't overlap too much. Getting a little technical here, but I use a low ISO setting (usually 100) to keep the noise down (the grainy stuff in night shots) and a small aperture like f11 so the long shutter speed doesn't over-expose the photos. Because the LEDs are pulsing they come out sharp even if everything else in the image is a bit soft and wonky. Some of my best shots were captured as I rode under street lights, you never quite know what you'll end up with. I take them in bursts and pick-out the best ones when I get home. You will get lots of rejects, that's half the fun. Does it require any special equipment? You probably need a camera with manual exposure controls, but you might get a result using the "fireworks" mode (or similar) on a compact camera. It's best if you can set the focus manually as you'll get mixed results letting the camera hunt around in the dark looking for something to focus on. I specifically bought a small camera (Sony RX100), so it's not a chore to carry along on bike rides. A wide-angle lens is handy if you need to get both wheels in the shot. Is there an objective or statement you hope to make with your photos? I'd like to think they portray the sheer joy of riding, and the fact you don't have to stop after it gets dark. Mostly though, it's about capturing the beauty of these mobile light-shows, they still entrance me. How did you hear about Monkeylectric? I stumbled across one of your early videos online, the one with the catchy electronic soundtrack. I couldn't afford that first model but when the M232 came out and someone began importing them to New Zealand I took the plunge. Because I'm always riding in the dark I thought it would increase my visibility and it sure did that! Check out more photos and posts from Antoine! We'd like to thank Antoine for sharing his insight and photography with us! We set up our M232s in Blue and Gold for the Golden State Warriors to celebrate their 20-0 start.